Are you a Yr 12-13 student? Are you interested in learning about other cultures? 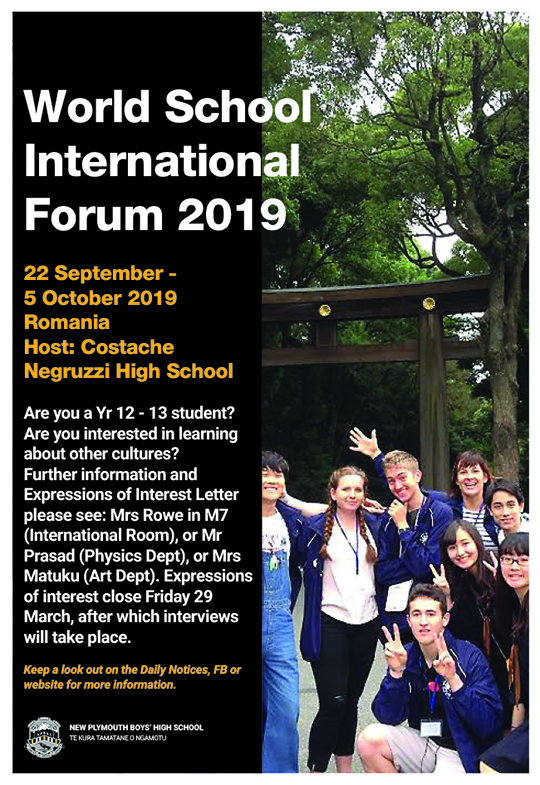 Would you like to represent our School by attending an International Forum Sunday 22 September to Saturday 5 October in Iași, Romania? This year’s host school will be Costache Negruzzi High School. NPBHS is the only school in NZ to be invited to attend this annual forum and three students and an accompanying teacher may participate. The approximate cost of the trip will be $4,000, plus any additional spending money. Further information and Expressions of Interest Letter please see: either Mrs Rowe in M7 (International Room), Mr Prasad (Physics Dept), or Mrs Matuku (Art Dept). Expressions of interest close Friday 29th March, after which interviews will take place.